Based on the wild success of his first book — which sold dozens and dozens of copies to family members far and wide — Richard penned another book, this one a horror novel called Homesick. The novel soared to the top of the Amazon horror charts (on days when he gave it away for free). While waiting for the rest of the world to discover and/or deride him, Richard spends his days as the executive editor of Soaps In Depth magazine. In that capacity, he has become something of an expert on topics ranging from doppelgangers to deaths, both real and faked. He also has so many Twitter accounts that it is rumored he is actually responsible for one-eighth of all tweets sent out into the universe. Were he being paid by the tweet, he would be a millionaire several times over. 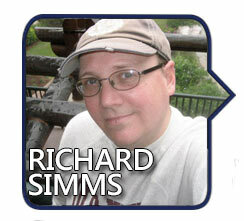 Speaking of writing he does for free, Richard’s pieces can also be found on a semi-regular basis on such sites as SweatpantsAndCoffee.com and TheTVaddict.com. October 31 – Richard Simms offers his picks for the scariest television shows and movies.